Every year, Arkansas attorneys who renew their law licenses are required by Arkansas Rule of Professional Conduct 1.15 to certify their compliance with court rules governing client trust accounts. In 2016, the Arkansas Supreme Court adopted rules that address how attorneys who handle client funds are supposed to deal with account balances that have gone unclaimed by a client entitled to the funds or that the attorney cannot trace to a rightful owner. Those rules require an attorney to remit unclaimed or unidentifiable funds to the Arkansas Access to Justice Foundation if, after a period of two years, the attorney is unable to identify or locate the person entitled to such funds. Beginning with this year’s IOLTA Compliance Statement, attorneys who handle client funds are required to certify that they have made a determination as to whether any of the client funds they manage include any unclaimed or unidentifiable funds. This certification is can be made by returning a hard copy of a completed, signed IOLTA Compliance Statement with the attorneys license fee payment, or by completing the required certification online. The deadline for completing the IOLTA Compliance Statement for 2018 is March 1, 2018. The Arkansas Supreme Court has adopted changes to Arkansas Rule of Professional Conduct 1.15 to lay out a mechanism by which attorneys or estates of deceased attorneys can deal with unclaimed or unidentifiable funds in client trust accounts. The opinion, issued November 5, also moved provisions of the rule that deal with bank compliance and interest rate comparability to an administrative order. The new provision addresses situations where an attorney, law firm, or estate of a deceased attorney (1) winds up in possession of client or third party funds and the client or third party cannot be located, despite diligent efforts to locate the rightful owner; or (2) is in possession of funds in a client trust account that cannot be traced back to a particular client. 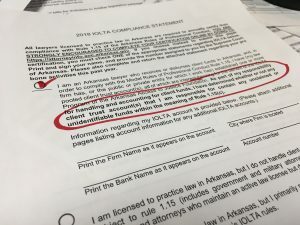 The Arkansas Access to Justice Foundation, which administers the IOLTA program, has updated its Guidebook for Attorneys and Financial Institutions to include guidance for compliance with the new rule and has adopted forms for attorneys to use to report and remit such funds to the Foundation and to return the funds to the rightful owner if a claim for the funds is made. 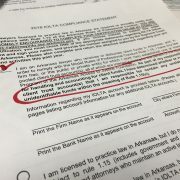 The Arkansas rule change addresses these scenarios by providing a simple process for attorneys to dispose of unclaimed and unidentifiable funds consistent with applicable ethical obligations, while generating additional revenue for the IOLTA Program of the Arkansas Access to Justice Foundation, which will use the funds to make grants supporting the provision of free civil legal aid to the poor. The Arkansas Supreme Court has issued an order soliciting comments from the bar and public regarding proposed changes to the Arkansas Rule of Professional Conduct governing IOLTA accounts that would lay out a mechanism for addressing situations where an attorney, law firm, or estate of a deceased attorney (1) winds up in possession of client or third party funds and the client or third party cannot be located, despite diligent efforts to locate the rightful owner; or (2) is in possession of funds in a client trust account that cannot be traced back to a particular client. In the first scenario—involving “unclaimed” trust account funds—the Arkansas Uniform Disposition of Unclaimed Property Act has historically served as the only source of guidance. Under that Act, client funds are presumed to be abandoned after seven years have passed without any contact or instructions from the property’s owner. The process for disposing client funds under this Act is often cumbersome—particularly for attorneys dealing with relatively small amounts of money—and it is inconsistent with the five-year period that attorneys are normally required to retain client records. When law firms merge and combine records, there may be balances that have no client identifier surviving in the records. A number of other states have implemented or considered implementing provisions to address the problem of unclaimed or unidentified trust account funds. The proposed Arkansas rule change addresses these scenarios by providing a simple process for attorneys to dispose of unclaimed and unidentifiable funds consistent with applicable ethical obligations, while generating additional revenue for the IOLTA Program of the Arkansas Access to Justice Foundation, which will use the funds to make grants supporting the provision of free civil legal aid to the poor. Historically low interest rates have resulted in catastrophic decreases in IOLTA revenue over the last five years, resulting in significant funding cuts for legal aid. Comments should be submitted in writing and addressed to Stacey Pectol, Clerk of the Arkansas Supreme, Court, Attn: Rule 1.15, Justice Building, 625 Marshall Street, Little Rock, Arkansas 72201. The deadline for submitting comments is September 15, 2015. On December 18, 2014, President Obama signed into law the Credit Union Share Insurance Fund Parity Act, which provides for federal insurance of IOLTA funds held at credit unions in the same manner and amount as provided for through the FDIC at banks. Even though Arkansas’s Rule 1.15 already authorizes credit unions as IOLTA depositories, the lack of insurance for funds belonging to non-credit-union-member clients was likely a major deterrent. Passage of the act eliminates what has been the major obstacle for attorneys wishing to utilize credit unions for their IOLTA accounts. Do you do business with a credit union? Would you consider opening an IOLTA account with one? Contact us and we can walk you through the process. For additional information about the Credit Union Share Insurance Fund Parity Act and its significance for the IOLTA community, click here. The Arkansas Supreme Court has approved the merger of the Arkansas IOLTA Foundation and Arkansas Access to Justice Foundation effective January 1, 2014, according to an opinion handed down today. The surviving entity will be called the Arkansas Access to Justice Foundation and will continue the functions related to collection of interest earned on lawyer’s trust accounts as the “IOLTA Program” of the Arkansas Access to Justice Foundation. The Arkansas IOLTA Foundation, which was incorporated in 1985, was established for the purpose of receiving interest earned on lawyer’s trust accounts and using the revenues generated to make grants to provide funds for legal services to the poor, projects that improve the administration of justice, and legal education. The Arkansas Access to Justice Foundation was incorporated in September 2009 to promote and support access to the civil justice system by Arkansans who cannot afford an attorney, primarily by generating financial support for statewide efforts to increase access to justice. “This is a very positive development that we believe will allow the Arkansas access to justice community to maximize the impact of our collective efforts to fulfill the Constitution’s promise of equal justice under the law,” said Amy Johnson, who serves as Executive Director of each organization. In 2013, the boards of the IOLTA Foundation and AATJF—recognizing the need to diversify the funding sources of their respective organizations, maximize resources to support grantee organizations, and leverage statewide support for their closely aligned missions—voted to merge the two organizations. They filed a petition requesting the merger in April. The order approving the merger adopts conforming amendments to Arkansas Rule of Professional Conduct 1.15 and section 28 of the Arkansas Procedures Governing Professional Conduct. These amendments simply substitute “Arkansas Access to Justice Foundation” for “Arkansas IOLTA Foundation,” where appropriate. According to Johnson, the merger will not otherwise affect IOLTA accounts, so no action on the part of attorneys or banks that participate in the IOLTA Program will be necessary. The surviving foundation will retain the IOLTA Foundation’s Tax ID number.